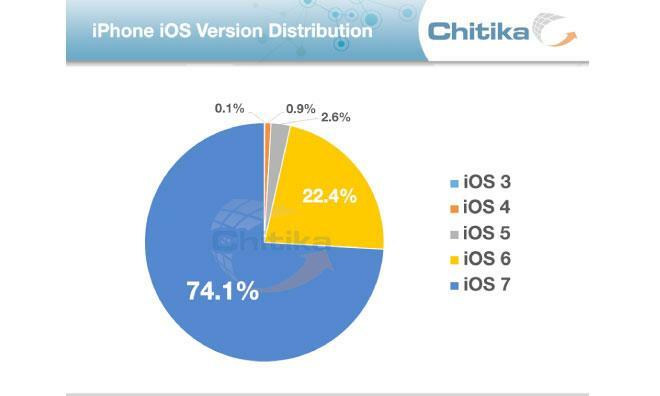 Adoption has slowed since iOS 7's rocket-like first week— which saw it explode to take more than 50 percent share— but continues to outstrip that of its predecessor, iOS 6, according to data collected by web and advertising analytics firm Chitika. The company examined "tens of millions" of ad impressions served to iOS devices in North America between Oct. 25 and Nov. 18. By comparison, iOS 6 took nearly six months to reach 83 percent of iOS devices. The streamlined operating system has seen slower growth on Apple's iPad, though much of the difference is likely attributable to first-generation iPads which have not yet reached the end of their useful life. iOS 5— the last iOS version supported by the original iPad —maintains a 9 percent share of iPad traffic. Apple's ability to migrate device owners to the latest version of their software stands in stark contrast to its primary mobile competition, devices running Google's Android. Aside from Google's Nexus family of devices, which are designed to model a "pure Android" experience, phone manufacturers and carriers are in control of how and when their handsets will receive updates. Customizations, like carrier-specific apps and manufacturer-added skins, add to the time required to roll out updates. Even recently-released flagship devices such as LG's G2, on which Google's new Nexus 5 is based, are not immune. LG has said that the G2 will not receive the latest revision of Android —version 4.4, dubbed "KitKat"— until March of 2014. 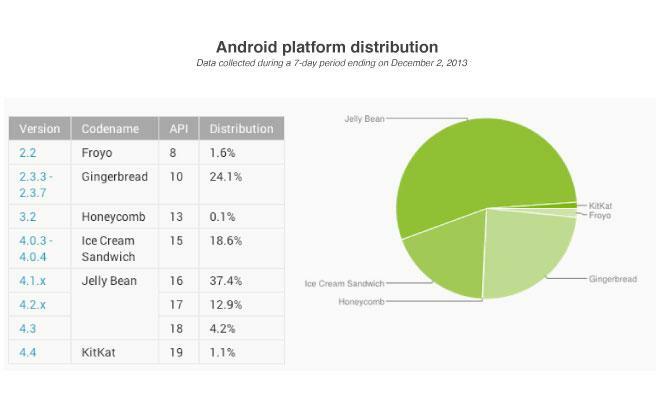 According to Google's developer platform versions dashboard, nearly one quarter of Android devices are still running versions of Android at least two years old.